Boost your amino acid intake in order to promote lean muscle growth and enhance recovery with Her Aminos from NLA for Her. This supplement can help fuel your muscles with nutrients in order to increase protein synthesis and fight muscle breakdown. 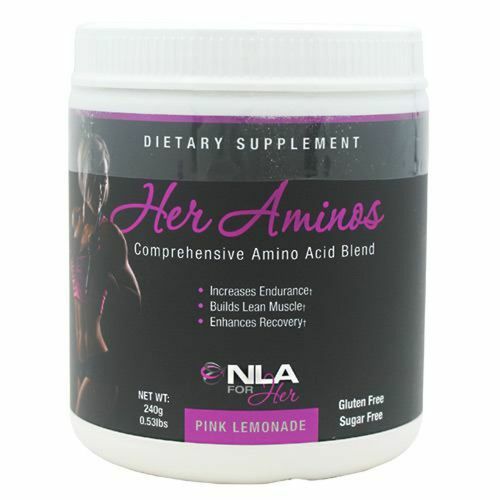 Her Aminos from NLA for Her can also help improve your recovery after workouts so you can start back again more quickly. Her Aminos from NLA for Her can give you the amino acid support your body needs to promote muscle growth and help you to achieve the fitness and body results you want. Get yours today at eVitamins for a low price, and enjoy great savings! Advertências: Manufactured in a facility and equipment that handles eggs, wheat, soy, milk, tree nuts, peanuts, soybeans, shellfish and fish. Recomendações de uso: Mix 1 scoop with 6-8 oz. of cold water or any beverage of your choice immediately upon waking, before, during, or after your workouts. Supplementing before, during, and after your workouts will enhance muscular endurance and prevent muscle wasting, promoting increased recovery and strength gains. The amino acid Beta Alanine may cause a slight tingling sensation. NLA for Her Avaliações de Clientes.